Brittany and Nick got married and had their wedding reception at Mythe Barn in Leicestershire. Mixing rustic and contemporary elements, Mythe Barn is a picturesque wedding venue set among acres of Leicestershire countryside. Mythe Barn offers exclusive use. Civil ceremonies can be held inside under stunning oak beams or outside in the fabulous gardens. Mythe Barn has some great options when it comes to food too - They can cater for everything from an informal barbecue to a sit-down formal wedding breakfast. Brittany and her bridesmaids got ready in the bridal preparation room within the barn, whilst Nick got dressed at home and arrived later in the morning. The bridal suite at Mythe Barn is beautiful. Set in the upper level of the barn, it allows views over both sides of the venue. 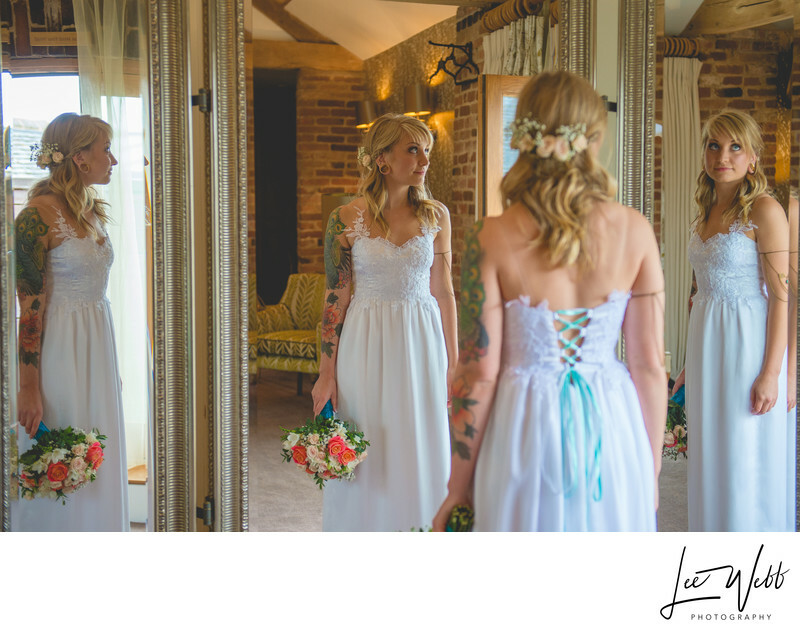 A floor to ceiling mirror gives a fantastic opportunity for some stunning bridal portraits, as you can see below. 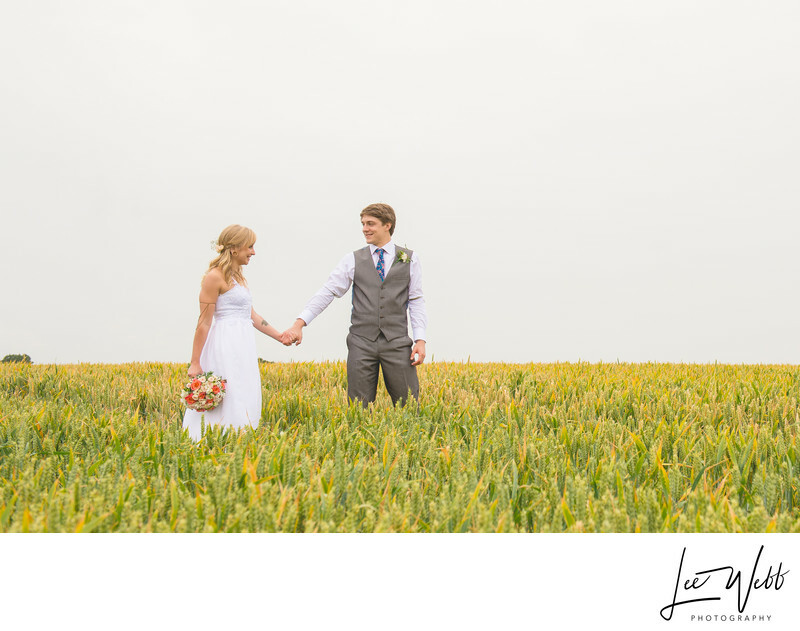 Whilst I was driving into Mythe Barn on the morning of Nick and Brittany's wedding, I noticed a wheat field just to the side of the road. After spending a little time in the gardens of the barn itself, we took a little walk back to the field for some photos of the bride and groom on their own. It had been raining all morning and the rain wasn't stopping, so the ground was soaking and the field was really muddy. To make sure she didn't ruin her dress, Nick carried Brit into the field! Whilst I was getting the couple into position and working out the camera settings, I had two of Nick's groomsmen standing with umbrellas over the bride and groom. As soon as I was ready, the groomsmen disappeared from the frame and I took a few snaps before they ran back in. To view the Mythe Barn weddings website, please click here. Location: Pinwall Lane, Sheepy Magna, Atherstone, Leicestershire, CV9 3PF.